This month I have managed to use up quite a few things, which means YAY for more counter space! Products that I would not purchase would be the Nars primer or the Dr. Brandt - Pores No More primer. The texture of both of these are very different, the Nars is very runny and the Dr. Brandt one is a super whipped texture. After the Nars one dried on my skin, it left a tacky-ish texture, it wasn't sticky? but it didn't feel dry either? It wasn't for me and it left my skin oily mid-day. The Dr. Brandt one didn't cover my pores well, and had a VERY pungent herbally smell. It didn't last long, but the results of the product weren't good enough for me to keep using it. Products that I may purchase again are the Amazing Cosmetics Foundation or the Maybelline Illegal Length Mascara. Both of these products delivered, I like them, but honestly there are so many different types of foundation and mascaras out there that I would like to try different ones first before deciding if I will come back to this one. Same goes for the H20 Hydrating Toner and Mac - Fix+. I used the H20 primer in high school, its a classic good one - I bought it on sale at Winners for $6.99, that's a bargain. The Mac Fix+ is good, but there are so many different setting sprays I might try them out before I come back to this. Rift now, I'm loving the Urban Decay Chill Setting Spray. Products I love and will purchase are: the Nivea In-Shower Body Milk - it provides a very good layer of hydration and moisture that lasts through the day without being greasy. Bioderma Micelle Solution - I have used this for years, it takes off everything with ease - put some on a cotton pad and it will take off waterproof mascara and gel liner, I love it. Mac Brush Cleanser - I like this as a daily cleanser. I do not use this to do a deep cleaning of my brushes - I only use this to spot clean after each makeup application to prevent buildup. I use the Sephora Solid Bar Cleanser and my heart belongs to that. 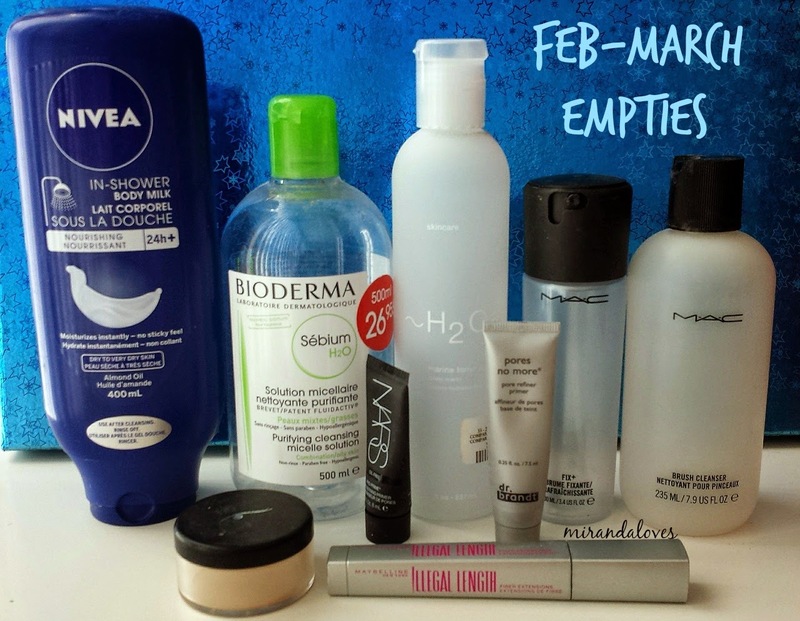 What are some of your empties this month? Please share them with me, I would love to hear from you.